The popular lecture series, presented by the Tobacco Free Partnership of Martin County, kicks off on February 6, and will take place on six Monday evenings at 7:00 p.m. through March 27, with no lecture scheduled for February 20 or March 13. 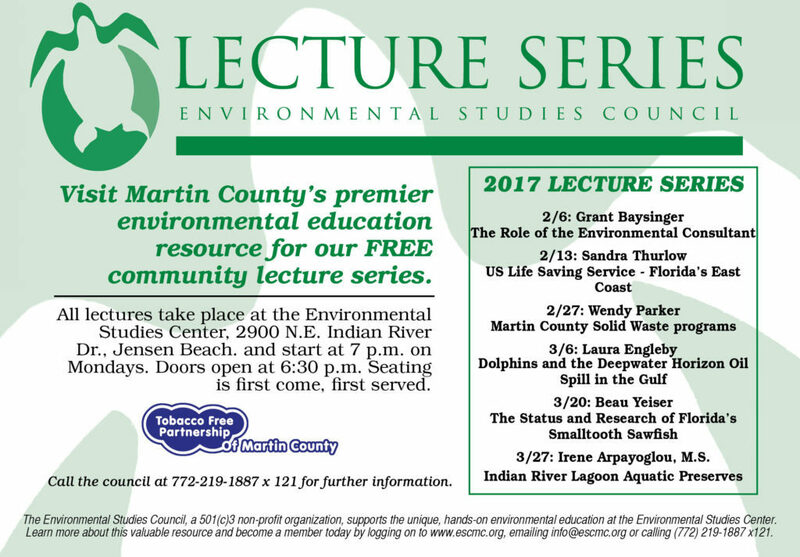 All lectures will take place at the Environmental Studies Center auditorium, located at 2900 NE Indian River Drive in Jensen Beach. The Environmental Lecture Series is FREE and open to the public. Doors will open at 6:30 p.m., and seating is available on a first-come first-served basis. This year’s speaker schedule features Grant Baysinger, Environmental Specialist with Ecological Associates, Inc., on February 6 discussing the role of the environmental consultant; Sandra Thurlow, author and local historian, on February 13 discussing US Life Saving Service – Florida’s East Coast; Wendy Parker on February 27 discussing Martin County Solid Waste programs; Laura Engleby, chief of the Marine Mammal Branch of the NOAA Fisheries Southeast Region, on March 6 discussing dolphins and the Deepwater Horizon oil spill in the Gulf of Mexico; Beau Yeiser, biological scientist, on March 20 discussing the status and research of Florida’s Smalltooth Sawfish; and Irene Arpayoglou, M.S. on March 27 discussing Indian River Lagoon Aquatic Preserves. All lectures are free and open to the public. The Lecture Series is by the Environmental Studies Council, the non-profit organization established in 1978 to support, protect and enhance the unique environmental education programs of the Environmental Studies Center. Donations are accepted and Council memberships will be available at each lecture. Each year the Environmental Studies Council provides funding for college scholarships, a teaching position at the Center, educational outreach programs, new exhibits at the Center and much more. Most recently, the Council raised funds for the Center’s new sea turtle exhibits and secured funding from the Save the Sea Turtles Foundation to restore the River Scout boat. For more information, visit escmc.org or call 772.334.4643.